Style2Bone's Dominique N leads the way in showing cool dungarees do not have to be denim! 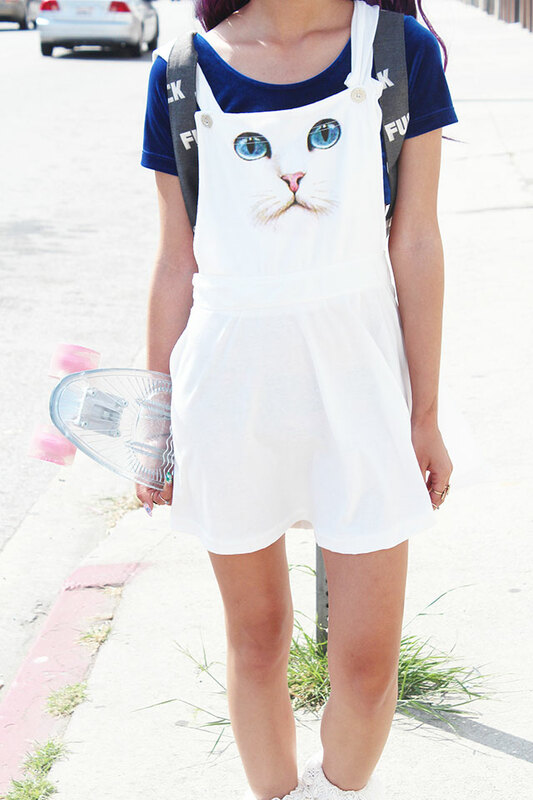 Dom's O Mighty Kitty Kat pinafore is a fab summer look. Daniela R's faux leather style from Stylegodis.com goes so well with her fantastic printed shirt. Really kwl Lua P look in her Motel Rocks version. Wioletta's colour pop style is fresh and original. Love it. Lucy D's super smart polka dots. Nun's Topshop skirt dungarees are another way for you to stand out from the crowd. Jennifer W's dungarees may be from asos but she defo wants you to see that super toned tum of hers. Sharena C's look is a masterclass in nailing fab hair, fantastic shoes and wonderful styling.